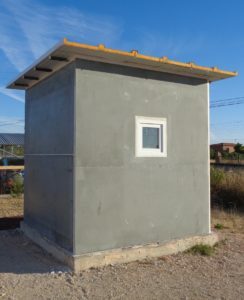 Mock-up buildings were constructed on two locations, one in Spain and one in Poland. The mock-ups consist of constructions of 2.5 x 2.5 x 2.5 m3. 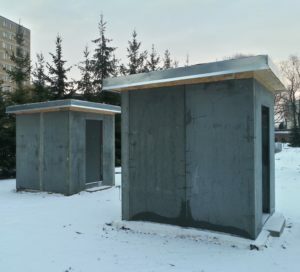 The mock-ups in Poland consisted of a reference building a muck-up with half panels and a mock-up with full panels. The structures are based on a concrete platform and have an insulated roof. A monitoring system was developed for the project and consisted of outside and in the walls embedded T-RH sensors, analog sensor nodes and BMS sensor nodes. The sensors register outside and inside changes in relative humidity and temperature as well as the same date from within the walls. The BMS node is transferring the data via internet to the responsible partner for data acquisition. The data give information about the thermal performance but more important about how long it will take for drying the panels. Since both sandwich and half panels consist of cement based materials a certain moisture from production is remaining. The data from the in-built sensors will give an indication about the drying process and can be used for the calibration of hygrothermal modelling.